Horses have the extraordinary ability to rotate their eyes to keep their horizontal pupils parallel with the ground as they lower their head to graze, researchers have found. This ability, which they also share with sheep, goats, and deer, provides the animals with the maximum effective field of view regardless of the angle of the head. The level of rotation ranged up to 50 degrees. Researchers labeled the ability remarkable and said it was an ability that was shared by humans and other predators. The finding arose from an analysis of 214 species of land animals. The study, published in the journal Science Advances, showed that a creature’s ecological niche was a strong predictor of pupil shape. Species with pupils that are vertical slits are more likely to be ambush predators that are active both day and night. 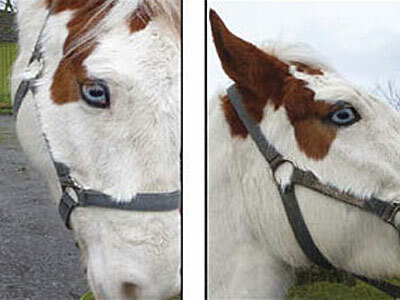 In contrast, those with horizontally elongated pupils, such as horses, are extremely likely to be plant-eating prey species with eyes on the sides of their heads. Circular pupils were linked to “active foragers,” or animals that chase down their prey. The study, led by vision scientist Martin Banks, a University of California Berkeley professor of optometry, in collaboration with Britain’s Durham University, presents a new hypothesis to explain the shape and orientation of pupils in difference species. Their research builds on the foundation set by the late Gordon Walls, a UC Berkeley professor of optometry who published The Vertebrate Eye and Its Adaptive Radiation in 1942. His classic text on eye physiology put forward the theory, generally accepted, that slit-shaped pupils allowed for different musculature and a greater range in the amount of light entering the eye. For example, the vertical slits of domestic cats and geckos undergo a 135 to 300-fold change in area between constricted and dilated states, while humans’ circular pupils undergo a mere 15-fold change. “For species that are active both night and day, like domestic cats, slit pupils provide the dynamic range needed to help them see in dim light yet not get blinded by the midday sun,” Banks said. To explain why horizontally elongated pupils, with few exceptions, corresponded to grazing prey animals such as horses, sheep and deer, the researchers turned to computer models to study the effects of different pupil shapes. They found that the horizontal pupils expanded the effective field of view. When stretched horizontally, the pupils are aligned with the ground, getting more light in from the front, back and sides. The orientation also helps limit the amount of dazzling light from the sun above so the animal can see the ground better, the researchers said. “The first key visual requirement for these animals is to detect approaching predators, which usually come from the ground, so they need to see panoramically on the ground with minimal blind spots,” Banks said. “To check this out, I spent hours at the Oakland Zoo, often surrounded by school kids on field trips, to observe the different animals,” he said. On the other side of the Atlantic, study co-author Gordon Love, a professor of physics at Durham University, found this same pattern when observing horses and sheep at nearby farms. Grazing animals’ eyes can rotate by 50 degrees or more in each eye, a range 10 times greater than human eyes, the researchers said. For ambush predators with vertical-slit pupils, the authors noted the importance of accurately gauging the distance animals would need to pounce on their prey. Researchers identified three cues generally used to gauge distance: stereopsis, or binocular disparity; motion parallax, in which closer objects move farther and faster across our field of vision; and blur, in which objects at different distances are out of focus. The researchers ruled out motion parallax as a factor since using that cue would require head movement that could reveal the predator’s position. The remaining two cues, binocular disparity and blur, work together with vertically elongated pupils and front-facing eyes, the researchers said. Binocular vision works better at judging differences when contours are vertical and objects are at a distance, while blur comes into play for horizontal contours and near-field targets. Vertical-slit pupils maximize both cues, the researchers said. Vertical pupils are not equally distributed among ambush predators, however. William Sprague, a postdoctoral researcher in Banks’ laboratory, said: “A surprising thing we noticed from this study is that the slit pupils were linked to predators that were close to the ground. Among the 65 frontal-eyed, ambush predators in this study, 44 had vertical pupils, and 36 of them had shoulder heights that were less than 42 centimeters (16.5 inches). Vertical pupils appear to maximize the ability of small animals to judge distances to prey. The authors explained this by calculating that depth-of-field cues based upon blur are more effective for estimating distances for short animals than tall ones. The authors noted that this research focused on terrestrial species. They expect to examine associations of aquatic, aerial and arboreal life on eye position and pupil shape in future studies. Other co-authors of the study are Jürgen Schmoll and Jared Parnell at Durham University. The National Institutes of Health and the Engineering and Physical Sciences Research Council helped support this research.